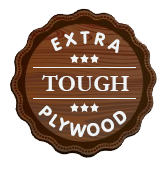 As the most trusted name in plywood industry today, we understand that a consumer expects a lot from us and not just to our esteemed clientele, we are also answerable to ourselves for the quality and performance of our own products and we make sure that quality remains the benchmark at every step. In the very first stage finest wood is selected on the basis of flawless testing procedure. Whatever quality of wood we choose, we meticulously test its quality and strength. Selected wood is seasoned at our ultra ’Turbo Rotation Dryer System’s that ensure the level of moisture content to its optimum level conforming to the BIS standards with minimum temperature variations. Selected wood is transformed into core. 100% core of wood is used instead of short core to give maximum strength and durability to the plywood which forms another unique advantage in our products. After this, a series of special tests are conducted to ensure that we live up to our yardsticks of impeccable quality.